With our hands holding the frog, and the tip pointing straight up, our fingers would climb their way up the stick all the way to the top, then back down again. Every inch of the bow gave a different challenge to the hand’s stability because of the constant shift in the bow’s balance. Coming down was much harder than going up. And yet each of us hung in dearly and rarely dropped the bow. What was the point of this exercise? One of the properties of the bow hold is that the fingers should have a light touch on the stick. Rather than the fingers lying like dead weight on the bow, they should fall over the stick with the lightness of bangs over a forehead. These feelings of a “light touch” are demonstrated by the crab crawler. What the fingers learn in this exercise is that they are not immobile. They respond to whatever job they are required to do. 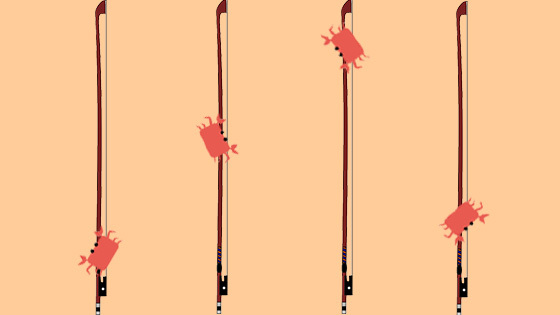 As the weight and balance of the bow changes while the hand is moving up the stick, there are subtle shifts in the way the fingers react. The muscles accompanying the fingers will flex and relax in a variety of ways. While clinging to the stick is a no-no, it’s no surprise how easy it is to squeeze the stick until your wrist, hand, and fingers are hurting. It’s a miracle when a child holds the bow with lightness and moves it the organic way, in which the bow moves itself and the hand and fingers just go along for the ride. Instead, the usual bad habit is that the narrow stick and the child’s hand fit together awkwardly. What doesn’t fit, will fight instead. When the hand clumsily holds the weight-disproportionate stick, clinging and a misshapen hand become the child’s right-hand scourge. The crab crawler demonstrates a hint of what a positive bow experience should feel like. The obvious benefit is that the fingers drape themselves around the stick without the type of static-cling associated with pants that stick to the body. For those of us whose thumbs press hard against the stick and squeeze the life out of it, the exercise makes it impossible for the thumb to seize up and strangle the bow. There’s a hidden benefit of this exercise in the way the fingers have to constantly adjust to the varying changes in the bow’s weight and balance. Violinists know how important it is to blend with the ensemble and predict what changes are coming up. A Baroque ensemble that plays with minimum vibrato and lots of light, upper-bow sound, will require a sound unlike what the violinist produced at home. At the opposite extreme, a violinist in Eugene Ormandy’s Philadelphia Orchestra would be required to play with a very dynamic and energetic vibrato, with the accompanying thick bow sound. What these examples impress on a musician is the awareness that he has to create the necessary sound at the precise moment. Someone with a fixed, clampy bow grip is less likely to produce a string sound that blends with everyone else. Given the subtle interplay between right fingers, momentary muscular jabs, and the hair that has a perfect, but mysterious, relationship with the string, a flexible hand that allows breathing room as it holds the stick is necessary. The crab crawler, the exercise given to us when we didn’t even know what vibrato and third position were, simulates the hand position of a master violinist. The difference between a merely great violinist and Heifetz, Frang, and Shaham lies in an understanding of how flexible sound is, and how adaptable our hands needs to be to capture the split-second tonal and thematic changes. While the bow and bow-arm is a multi-level machine, first and foremost it is guided by the expectations and sophistication of the ear. Whereas the beginning violinist is induced to flatten the whole apparatus, the bow begs for more understanding. Think of each level needing its independence, all the way from the fingers, through the stick, then the hair, and finally the string. It’s no surprise that children scratch at the moment of connection with the string. Once they flatten the connection between the hair and the string, what’s to stop them from strangling the stick. What is supposed to be a four-layer devil’s food cake becomes a pancake with sticky syrup. Use the exercise we learned in elementary school to breathe life back into the bow arm. October 2, 2018 at 09:07 PM · I admit I never heard about this exercise. I also can assure you that it is not Leopold Mozart's, at least he didn't mention it in his book (which he would have given how important it is...). But maybe your description of the consequences of not doing it may be a tad hyperbolic. No? October 3, 2018 at 06:55 AM · Thank you for your humorous article. I enjoyed it. For this exercise, my beginners use round timber from the hardware store which is longer than my whole bow - so they have a longer way to crawl (cruel me) and we can let the windmill turn in the middle of the stick without endangering the precious bow. But the bow with it's different weight distribution comes in soon afterwards. October 3, 2018 at 04:57 PM · Thank you for your own testaments to this exercise-game many of us shared as beginning violinists. Each of us builds our own foundation and method, and the crab crawler was one small part of the whole. It makes me feel wonderful to know there is always room for daily growth. Verbalizing what we know is a big part of getting stronger on the violin. Our understanding of the bow arm is perhaps the most interesting mystery of them all. October 3, 2018 at 06:06 PM · That's a smart idea, for little ones, to start out simply with a stick of similar size! October 3, 2018 at 06:52 PM · Was taught this exercise January 1977 with "El Systems" in Caracas Venezuela....very helpful for understanding balance and control with all fingers in place. October 4, 2018 at 04:46 PM · Not Leopold! Amazing though his book (my bible) is in other respects he it was who first used the accursed word "grip"! Admittedly he did qualify it by advising to "grip the bow lightly"! I once observed to Julian Lloyd Webber "If you hold the bow tightly, your whole arm goes stiff". His reply? "If you hold the bow tightly your whole BODY goes stiff!. October 5, 2018 at 12:26 AM · Learned this exercise while studying in Japan with Shinichi Suzuki in 1980’s. October 6, 2018 at 12:54 PM · I enjoyed Julian Lloyd Weber’s reply. To acknowledge that the whole body goes stiff if you hold the bow too tightly makes me aware of the ripple effect of a bad habit. Thank you for your testaments to this quirky little exercise. To the quartet who raced each other, you showed that a bow exercise can become a rhythm exercise. No mattered who invented this exercise, it’s still alive!